Jonathan Tiernan-Locke (Endura Racing) attacked into the 2012 Tour of Britain gold jersey over the two climbs of Caerphilly Mountain on the sixth stage, between Welshpool and Caerphilly. Tiernan-Locke was joined by Leopold König (NetApp) on the second of those ascents, and the Czech rider went on to take the stage, as the two riders managed to hold off a chase group that contained most of the overall contenders in the race. “I set out for a stage win target," said König after the finish. "I knew before that I only had to follow Jon [Tiernan-Locke] because he’s strong and it’s his home race and he was pretty motivated so I just did it. Nathan Haas (Garmin-Sharp) led the group home, ahead of Damiano Caruso (Liquigas-Cannondale) and Luke Rowe (Team Sky), 19 seconds behind König. Race leader Leigh Howard (Orica-GreenEdge) finished in a second group, 14 seconds behind the first, and the Australian saw his gold jersey pass to Tiernan-Locke. “It did go as planned,” said the Endura Racing rider. “I’d played it through in my mind, over and over last night and through the stage. Doesn’t mean it was easy, we had to really fight to be up the front and there were some dangerous parts on the stage with some cross-winds but it did go as planned and it was a relief to finish it off. The 189.6km stage featured a six-man breakaway group, made up of Marcin Bialobloki (Node4-Giordana), Dan Craven (IG-Sigma Sport), Kristian House (Rapha Condor), Pieter Ghyllebert (AN Post-Sean Kelly), Graham Briggs (Raleigh-GAC) and Magnus Backstedt (UK Youth). The sextet were allowed to open up an eight-minute lead in the first half of the stage, and were only caught by the chasing peloton as Tiernan-Locke passed them on the first climb of Caerphilly Mountain. Only Briggs was able to stay with the Endura Racing rider, with König bridging shortly before the second time up the climb. Ghyllebert managed to rejoin the leaders shortly before the climb began, but was quickly dropped as König accelerated on the lower slopes; Briggs too was soon dropped as Tiernan-Locke began to pile on the pressure. The two riders were ten seconds clear of a chase from Josh Edmondson (Great Britain) over the top of the climb, with the rest of the chase group another ten seconds back. The young British rider was reeled in by the chasers in the closing kilometres, but the couldn’t catch König and Tiernan-Locke, who went on to contest the stage finish. Bialobloki, Craven, House, Ghyllebert, Briggs and Backstedt escaped in the very first moments. Howard’s Orica-GreenEdge team was in control of the peloton and, with none of the six any danger whatsoever to the Australian’s lead, they were allowed to build a huge lead. 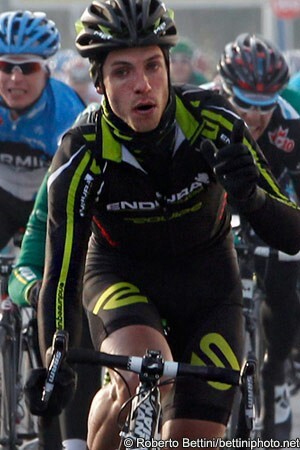 Shortly after Bialobloki took first place at the first intermediate sprint, in Kerry after 25.2km, the group was eight minutes clear. With the help of Endura Racing, Orica-GreenEdge then began to gradually close the gap to the six leaders. As mountains leader House took the maximum points over the 1st category climb of Cwm Owen, after 91.5km, the gap had been cut to 4’30”; as the leaders passed through Brecon after 110.2km, to start the 1st category climb of Brecon Beacons, it was down to 3’55”. House led over the top once more but, behind him, the peloton began to split on the long, exposed road that followed climb. The front group contained Howard, Sep Vanmarcke, Nathan Haas and Steele Von Hoff (all Garmin-Sharp), Luke Rowe (Team Sky) and Tiernan-Locke. Over the top of the climb this group was just 1’14” behind the leaders but was soon caught by the rest of the peloton. As the speed relaxed a little the group’s advantage grew to 2’30”, as Bialobloki led over the intermediate sprint line in Mountain Ash after 154.2km. Endura Racing then took control of the front of the peloton, with former British champion Russell Downing leading the charge, and the gap began to close again. As the six-man group arrived at the foot of Caephilly Mountain for the first time, its lead was just 43 seconds as Team Sky hit the front of the peloton. Backstedt was soon dropped by his five companions on the steep climb, and was followed by Craven and Ghyllebert as Tiernan-Locke began to accelerate away from the peloton behind them. House and Briggs were the only ones left at the front, but then House was dropped too, as Tiernan-Locke passed the rest, caught Briggs and led the race over the top with 12.3km to go. Riders were breaking off the front of the peloton behind them, but Howard had missed out and was leading a group in pursuit. In the front group were Bartosz Huzarski and König (both NetApp), Damiano Caruso (Liquigas-Cannondale), Edmondson and stage one winner Luke Rowe (Team Sky). They were soon caught by a second group, which included Samuel Sánchez (Euskaltel-Euskadi), NetApp, Haas, Ivan Basso (Liquigas-Cannondale), Ghyllebert, David Lelay (Saur-Sojasun), Paul Voss (Endura Racing), Liam Holohan (Great Britain). Missing from the chase though, were the top three riders overall, in Howard, Boy van Poppel (UnitedHealthcare) and Sep Vanmarcke (Garmin-Sharp). König jumped away from chase group and joined the two leaders, and was followed by Ghyllebert, to make it a four-man group. The Belgian was dropped almost immediately however, as König accelerated just before the climb began, cutting the group to three again. Tiernan-Locke accelerated again, which got rid of Briggs, as Edmondson attacked the chase group 14 seconds behind. Tiernan-Locke led König over the top of the climb, with the young Britinsh rider nine seconds behind; the chase group was 20 seconds back, while the group containing Howard was 34 seconds back. The Australian’s grip on the gold jersey was slipping. Edmondson was caught by the chasers, which were led by Basso, but they were still 11 seconds behind the two leaders with two kilometres to go. Under the flamme rouge the gap was holding; König led into the final corner with 200 metres to go and opened up his sprint. Tiernan-Locke was unable to challenge as the Polish rider took the stage. Haas came in to take third place after 19 seconds, while Howard and van Poppel, followed after 33, meaning that Tiernan-Locke became the fifth rider to take the gold leader’s jersey. With just two stages left - including the following day across his home region of the south west - the Endura Racing rider was poised to become the first Briton to win his home Tour since its revival in 2004.